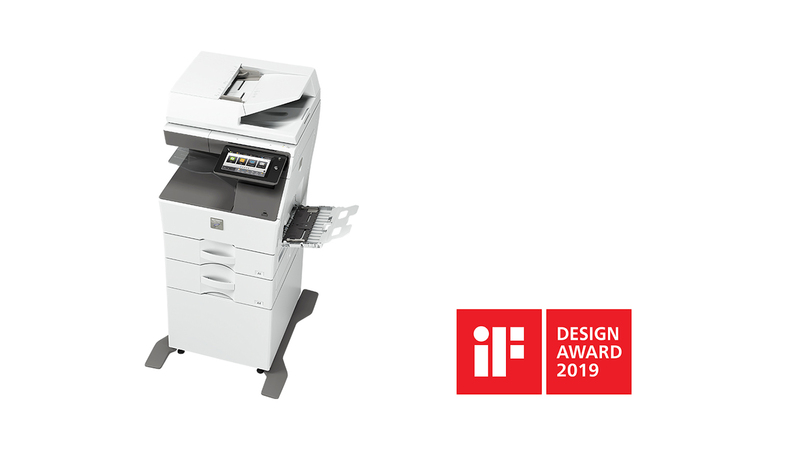 Sharp Corporation of New Zealand is proud to announce that it's MX-B455W/B355W*1 black-and-white A4 size digital MFP has won a 2019 iF Design Award. This award is one of the world's most prestigious product design accolades in the world. The iF Design Award recognises outstanding design in seven categories, such as product, packaging and communication (including web design). For all categories combined, the 2019 awards drew 6,375 entries from 52 countries. Sharp's MFD won in the Product category. Our goal was to design an A4 MFP that could be used next to a desk without being obtrusive. Aiming for a clean, streamlined form without protruding parts, Sharp arrived at a softly curved silhouette. What's more, this MFP has the same easy-to-use interface found on larger Sharp A3 machines. This means offices of any size can now enjoy the same user-friendly operation. The functions and specifications of the MX-B455W/B355W are designed to boost office productivity. The MX-B455W version offers high-speed colour scanning at 110 opm (two-sided) - one of the fastest scan speeds in the industry*2. Another highlight is connectivity with cloud services such as Google DriveTM and OneDrive®. Launched in 1953 and held every year, the iF Design Award is one of the world's most important design awards. It is organised by the iF International Forum Design GmbH, an international group based in Germany that promotes outstanding design. Award-winning products are displayed at the iF Design Exhibition in Hamburg, Germany. They can also be seen on the iF World Design Guide website and on the iF Design App for Android and iOS devices. *1 The MX-B355W is for markets outside Japan. *2 As of February 6, 2019, according to Sharp research. For A4 digital MFPs in the same output-speed range. Google Drive is a trademark of Google LLC. OneDrive is either a registered trademark or trademark of Microsoft Corporation in the US and/or other countries. Sharp Corporation of New Zealand is a subsidiary of Japan’s Sharp Electronics Corporation. Sharp is a worldwide developer of one-of-a-kind technologies, including home appliances, networked multi-functional office solutions and visual displays. View the Sharp Global press release here.